I’m a day late in joining Cathy for the Tuesday view, but I think it’s just that time of year when things begin to unravel and go to seed so hopefully my tardiness will be forgiven. Here it is! The view looks remarkably similar to last week’s with just a few more hints of autumn color in the background and a few more tints of brown in the front. We had a slight frost last Monday and again on Friday but for the most part the garden is intact. The tender new leaves of alocasia x portora took the low temperatures very seriously while the dahlias just shrugged them right off. Serves me right for not bringing this elephant ear in earlier. Last week’s lows have been followed by a few warm days but I think the damage has already been done. Most tropicals get all miffy once nighttime temperatures drop below 50 and I guess it’s time to start thinking seriously about bringing them in. My newest elephant ear, colocasia esculenta ‘tropical storm’ is gaining back a little strength following a run in with spider mites. 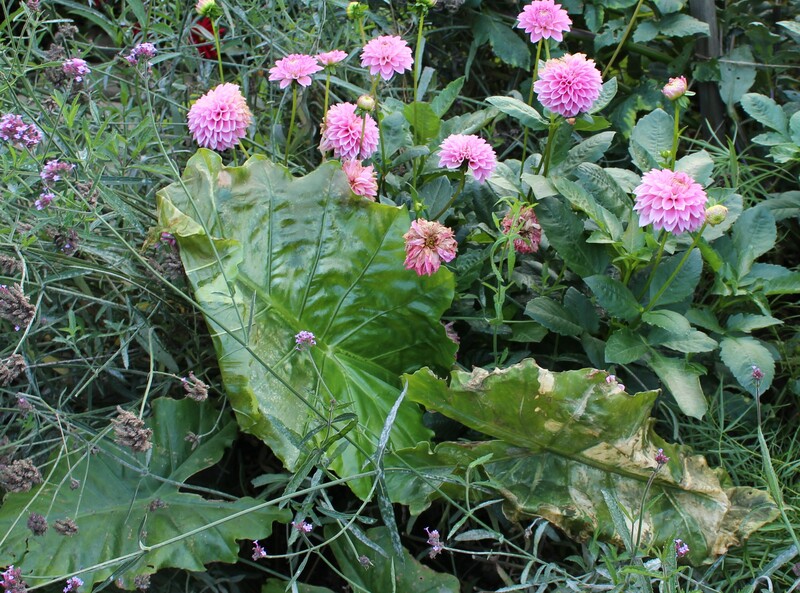 I ended up snipping off all the foliage to get rid of them, now it’s a matter of hoping for the best over winter. Even with some of the largest leaves showing a little frost damage, the cooler nights seem to intensify and brighten the last of the autumn colors. ‘Knockout’ rose seems to get even brighter as the thermometer drops. It’s a nice mix with the season long color of the Verbena bonariensis. Although I made a good effort of removing most of the chrysanthemums from this bed, I did leave ‘Carousel’ for some late season color. The plan was for it to carry on after frost blackened most of the other color in this bed, but here it is joining in as just another supporting player. I like it for the long stems and late blooms which last into November but tolerate it for it’s floppy stalks and necessary June pinching. Chrysanthemum ‘Carousel’ opening up as one of the last floral events of the 2016 tropical border. Looking up towards the back end. I love that all 6 feet of that annoyingly bright white vinyl fence is now hidden behind an interesting wall of greens and flowers. And I love that I still have plenty of dahlias! This entry was posted in annuals, chrysanthemums, Tropical garden, Tuesday view and tagged autumn, flowers, garden, tropical border, Tropicalismo. Still lots of nice color, Frank, but I can see the tropicals not liking the cooler temps. May you have a few more weeks before Jack Frost lays his hand upon your beautiful garden. 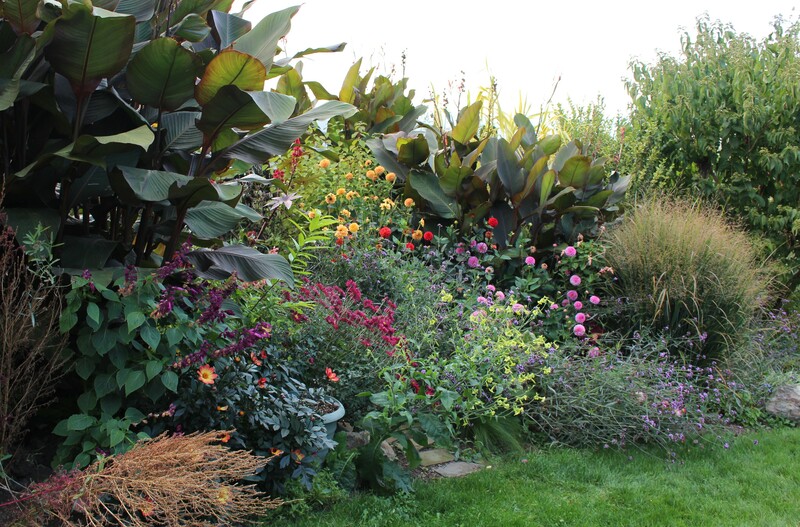 Your border is still looking so very colourful, in spite of your larger leaves not liking the cooler nights. I hope that one day my border by the field will look like this! Thanks! It’s not all that difficult and many of these might even be hardy for you. Also I bet there are other even more interesting things such as your phormium! Amazing. And it is mid-October! This has been such a successful bed, Frank. 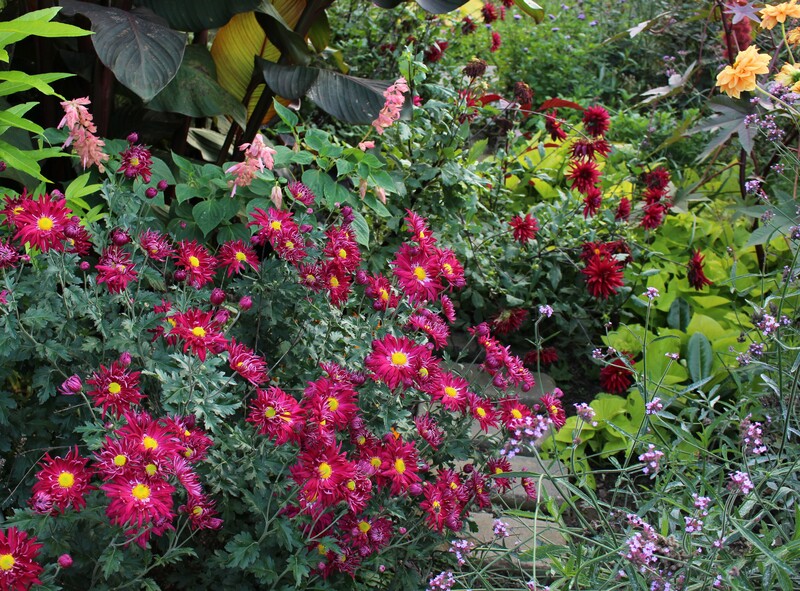 That Chrysanth adds some nice late colour, but the mix of different foliage is still the major eyecatcher. I think my container Ricinus and Tithonia will have to be remived at the weekend as we have had it cold and damp too long and they are sulking dreadfully! Have a good weekend! Thanks Cathy. I think I’ll start removing a few things this week as well. The banana and elephant ear won’t mind coming out already and this cooler weather is doing nothing for them. I did get plenty of seeds on the Ricinus and I’m sure it will find a spot next year again. Looking gorgeous! And so nice when it also blocks a view. The border is still looking great. I love that Chrysnthemum Carousel. I think they are wonderful for November colour and I am gradually adding to my collection, I can’ t think why I used to dislike them. I still loathe those big ones like a 1980s hairdo though. You can enjoy evening drinks outside without a jacket? That is amazing for late October. Today was a rude awakening as far as cooler weather and dampness. I actually needed to wear a jacket which did not please me at all. Tomorrow is forecast a little warmer again but eventually I’ll need to face reality and the fact that winter will eventually come. Until then I spend every day admiring the garden and the chrysanthemums especially. They’ve made it through the less than perfect growing season without any major complaints and I love all the colors. I have to admit though that the larger floppy blooms are my favorites, and I may even buy a few replacements and new ones this winter. I’m less of a fan of the rounded lumps of color, the cushions I believe. There are plenty of blobs of color in the local landscape, so I need something a little more grace here. Wow! 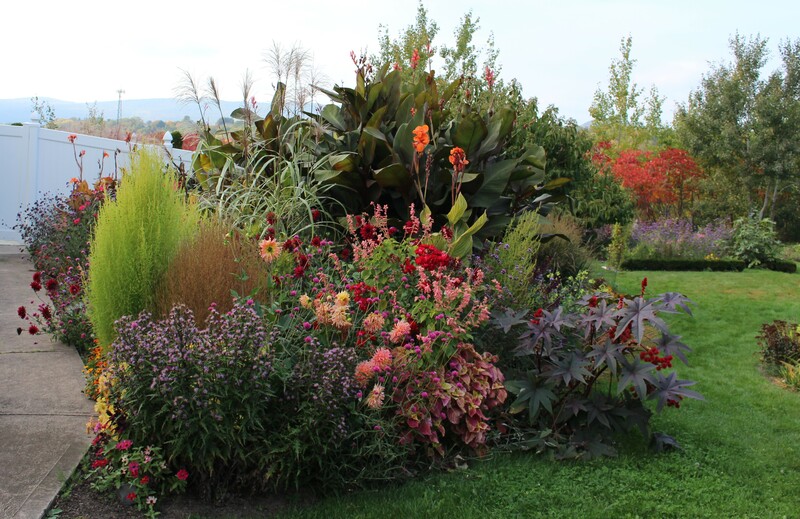 Gorgeous colors — and the canna look spectacular. Some kind of beetle feasted on mine — so they look a bit tattered. Your’s, on the other hand, still strong and beautiful! Well done. I think cannas are actually much easier up North. Most of the bugs which attack them are southerners and have no reason to come this far North just to ruin my fun! It looks terrific Frank! 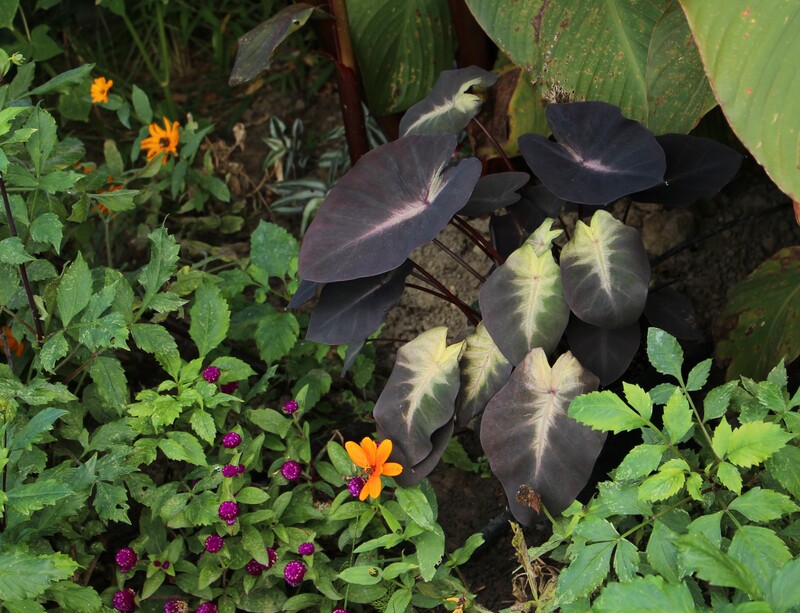 And my that dark-leaved Colocasia (spelling?) is lovely. 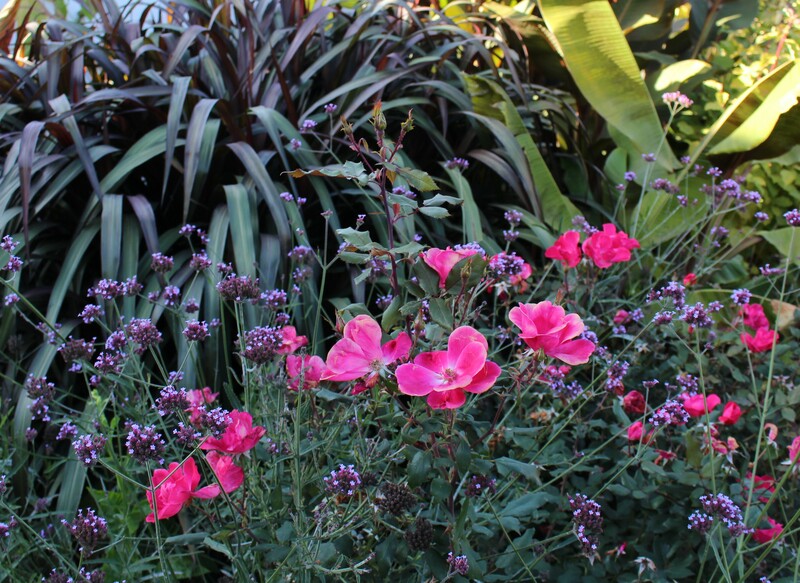 What’s the dark, moody strappy foliage behind your ‘Knockout’ rose and the verbena? Thanks for reminding me that I still need to rescue my banana!!! The strappy foliage is a pennisetum purpureum (Napier grass) hybrid. I could tell you which one but won’t be able to get anywhere near a label until frost kills it back! I love it but it sure is big, five feet tall and wide at least from a four inch pot this spring. Thanks for the ID – it looks beautiful. I must google it! So impressive. Enjoy these last blissful days of autumn. I’ve never gotten the chrysanthemum pinching figured out and as always, most of mine are soon to bloom where they flopped. My chrysanthemum was cut back in June I think and it still needs a few twigs in there to hold it up. I have several which need no pinching at all, but to be honest they’re a little boring and I like the floppers more! You may be on borrowed time but it’s still looking fantastic. Here’s to another week!